You’ve read all those travel blogs of people who bought a camper van and turned exploring the world into their full-time occupation. You could, however, opt for an idea that includes much more creativity and buy a school bus instead, to turn it into your own cozy home. It’s even better if you have an awesome mom to give you a hand. – Who is Lexis Noelle and what does she dream of? – My name is Lexis Noelle, I am a 19-year-old girl from New York with a strong desire to travel and explore new places. I was never the college/bookwork type so after I graduated High school I went to my mom and told her I need to do something that I’m going to love doing and sitting in school was not it. She knew who I was and what I loved so we decided since I love camping and exploring new places, why not get something that would make traveling a lot easier and fun to do! And that is where “Lola” came along. 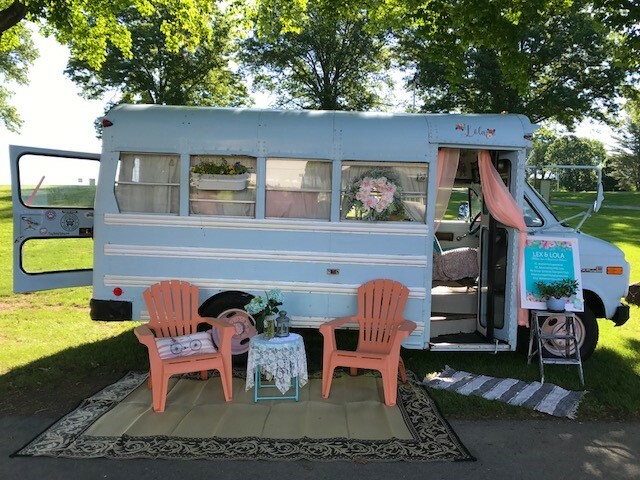 My biggest accomplishment so far was being invited by “Girl Camper“ (Janine Pettit) to be in the Rhinebeck NY, “Country Living Fair”. 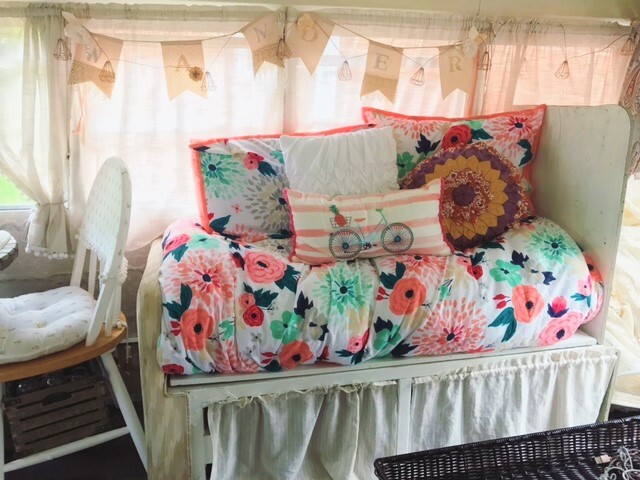 For years I had the “Country Living Magazine” delivered to my house and I remember flipping through the pages and looking at all the awesome décor and content they had. I never thought that “Lola” and I would be a part of the fair! Going to the fair really made me realize what I accomplished and it made me look at things so differently. 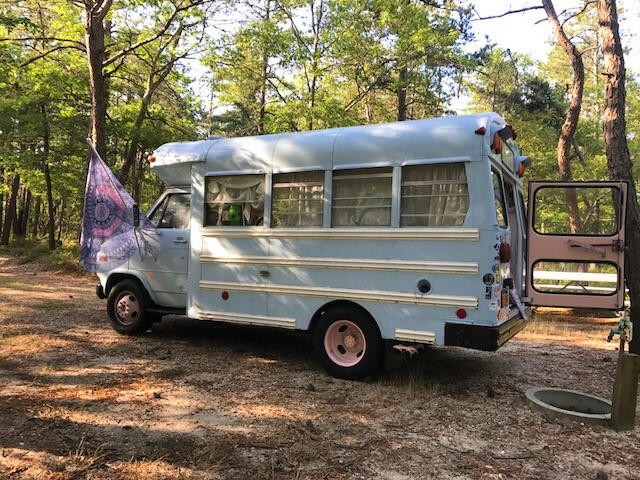 Talking to women/men about why I bought a bus instead of just going to a dealer and buying a brand new camper, and what she is capable of made them look at my idea in a totally different way than they could imagine. It was a 3-day fair with a lot of questions, a lot of answers, and a lot of pictures. It was an experience I will never forget. – Who is Lola and how (and when) did she come into your life? 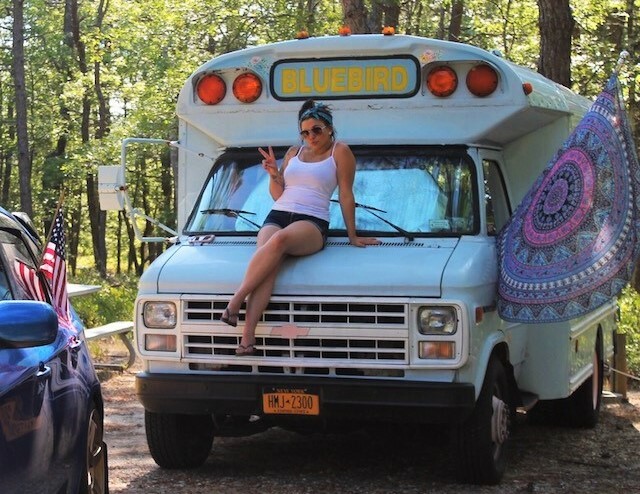 – “Lola” is a 1989 Canadian blue-bird short bus that my mother and I turned into a “glamper” on wheels. I was looking around for something that would suit my needs, and would be practical for me to handle driving. After months of looking for the perfect vehicle I was giving up hope on finding the right one. I stopped looking for little bit and went online one day just to see if maybe something came up, and there she was. 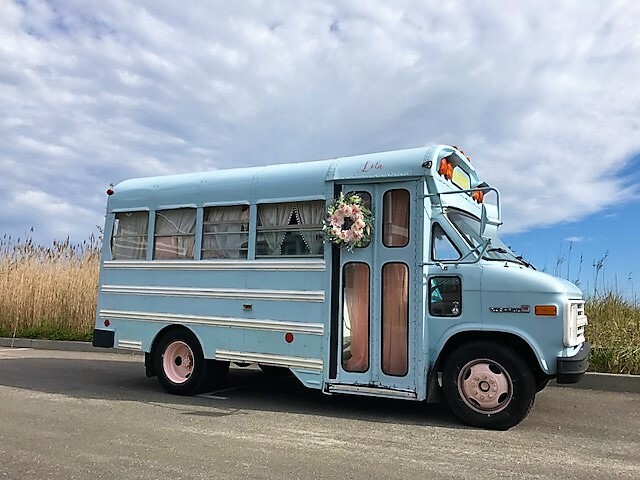 A light pastel little blue vintage bus with endless possibilities. I contacted the seller and he was a few blocks away from my house in the same town!!! My mother and I hopped in the car, went to his house, took her for a test drive, and the rest is history. She was mine. – How long did it take to renovate and furnish your bus? – My mother and I did the conversion together, being that she already had her own bus conversion. She knew how to lay a floor and do all the stuff I didn’t know how to do. She helped me with the layout and the “hard” parts and told me the rest was up to me to decorate and make my own. The conversion took about 3 months of sleepless nights, late night shopping runs, and a lot of laughs. – What was the hardest part? – The hardest part was choosing how I wanted my layout. What would be most practical for me, and utilizing the most space I could. – What was the fun part? – The fun part was definitely the decorating! I had tons of ideas and seeing those ideas come to life was amazing. – What are the perks of living a bus life? – The perks of living a “bus life” is escaping the everyday norm that a lot of people have a hard time separating from. 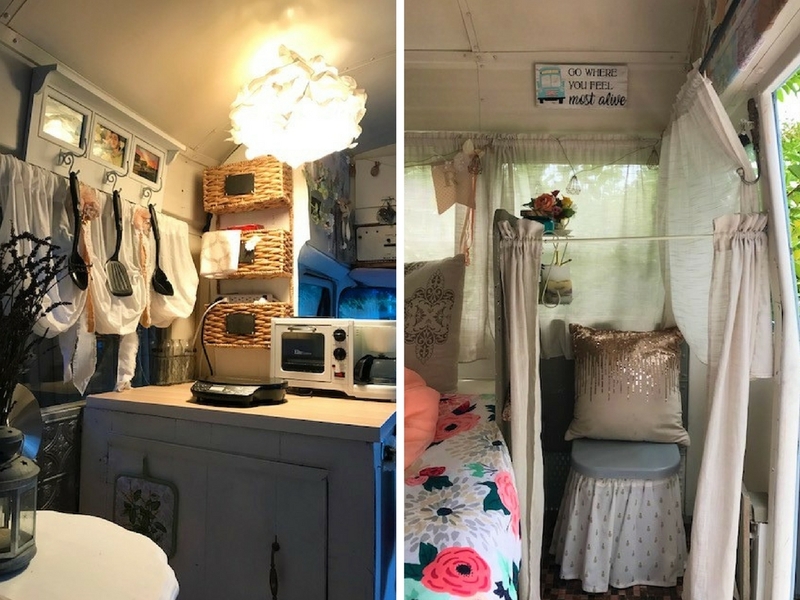 Living a “bus life” means you can literally take your little home on wheels anywhere and always have a place to hangout, cook, sleep, shower, go to the bathroom in. 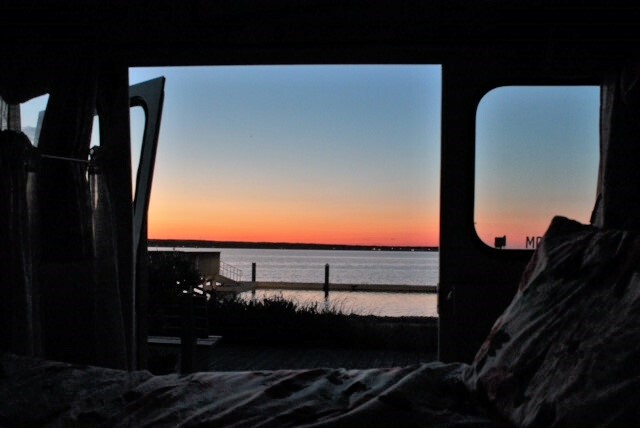 The feeling of being able to open your back door and having a different view of wherever you go, whether it is mountains, a lake, a sunset, a beach is something you cannot even put a price on. 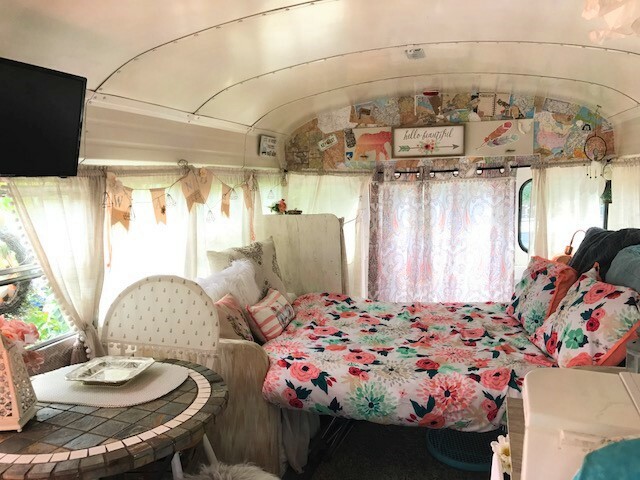 – What was one thing you hadn’t realized about living in a bus before you actually did it? 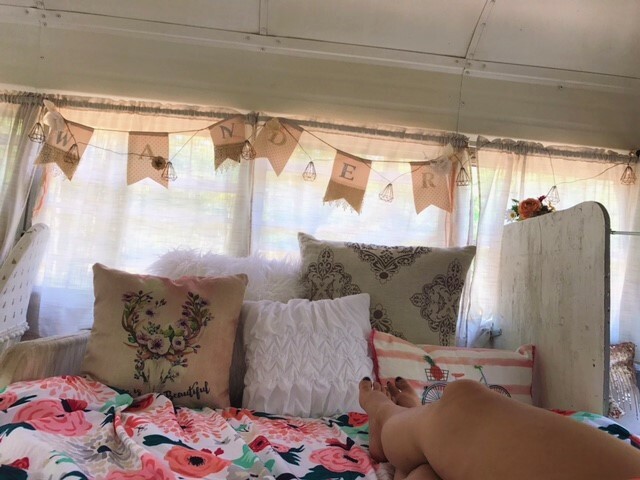 – Right now I am currently part time “bus life” working to save more money to be comfortable hitting the road full time in “Lola”. I travel on my weekends off and my vacation days, always with a plan to see or explore something new. – How do you find living with so little stuff? – One thing about “bus life” is that you seriously realize how much you don’t need. There is no better feeling than having only what you really need and not having the burden of clutter on your shoulders. – What’s the trip that has changed you the most? – My trip to Rhinebeck NY has been my favorite, seeing and meeting so many people and encouraging them to think outside the box gave me such an amazing feeling. Also watching them take a inside tour of “Lola” and seeing their reactions to how a short bus can fit a kitchen, bathroom, dining room and a full sized bed and still have a ton of space to move around freely completely shocked them. – Many people dream of breaking the routine and start living in a van or converted bus. What would you tell them? – I would tell those people if it is something they really would love to do, then they should 100% go for it. Make sure that the vehicle you want is going to suit your needs and comfort the best, watch a ton of Youtube videos on others living this lifestyle and most important have fun with it! – What’s one inspiring thing you’d share with us? – I am beyond happy that I have “Lola” and that she came out to be exactly what I wanted. I can’t thank my mother enough for pushing me to accomplish this goal, and always motivating me to go beyond my comfort zone . – One challenge for everyone reading this? Follow Adventuring with Lola on Facebook and Instagram.